These are the BEST monster cookie bars in the entire world! 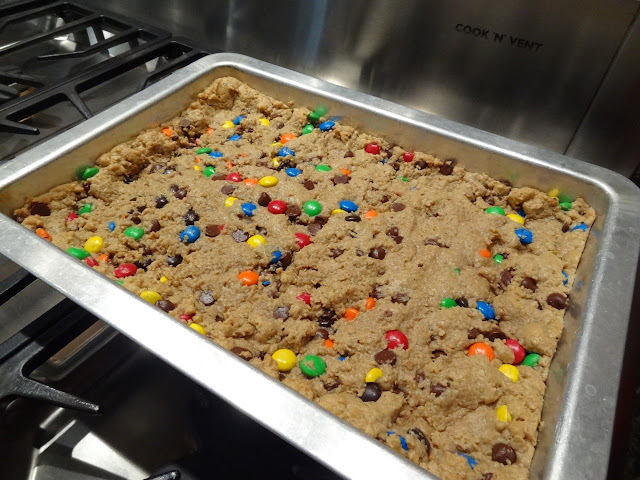 Literally 1-inch in thickness, these bars are chewy, gooey, moist and 10x better than regular ‘ole monster cookies. The combination of peanut butter, chocolate chips, M&M’s, and oats creates the most decadent cookie bar you’ll ever put in your mouth! For the past 4 years, my sister Brittany, was like the “team mom” for the Oklahoma State cross country team. She loves to bake and would make sweets for her boyfriend Colby and his teammates before each race. If you didn’t know, Brit and Colby got married last weekend. As you could guess, many of Colby’s cross country teammates were his groomsmen. To keep the baking tradition alive, Brittany decided to make these monster cookies bars for Colby and the groomsmen as a “pre-race”, aka pre-wedding treat! Right before the wedding, I mentioned to Brit that she should try to make monster cookie bars. She did some searching on her own and found this recipe through Marina’s blog over at Domesticated Duchess. What sold her on these bars was how thick they were! Lucky for me, Brittany was thoughtful (perhaps because I pleaded…Lol) and saved 3-4 monster cookie bars for me to snack on. Thank goodness, because as I said earlier, they were AWESOME! Spread dough into a greased 9 x 13-inch pan. Bake for 15-20 minutes in a 350 degree F oven. Let cool. Then cut into bars. 2. In an electric mixer, cream the butter and sugars until smooth. Beat in the eggs and baking soda. Then ddd the peanut butter and beat until smooth. 3. Mix by hand the oatmeal, one cup at a time. 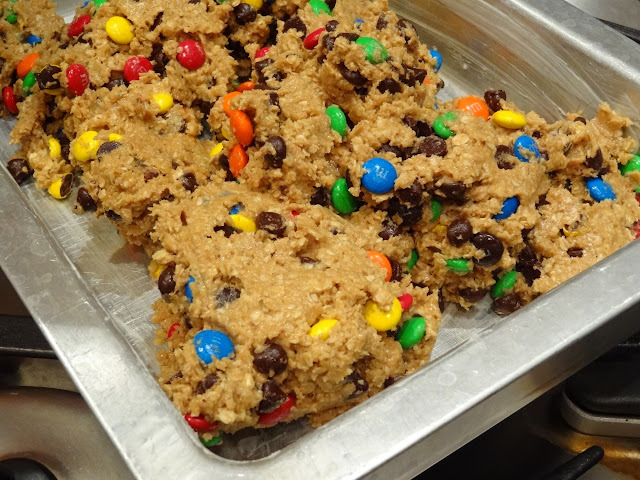 Slowly add in the M&M’s and chocolate chips. 4. 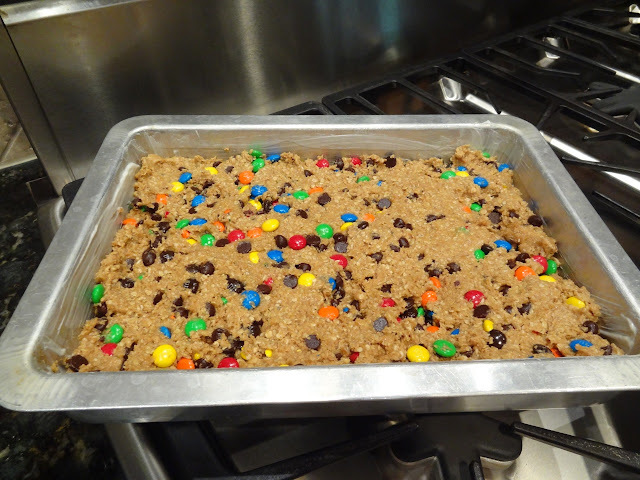 Spread mixture into a well greased 9 x 13-inch pan and bake for 15-20 minutes. Do not over bake! (They will taste better just a little on the soft side.) Store in an airtight container. 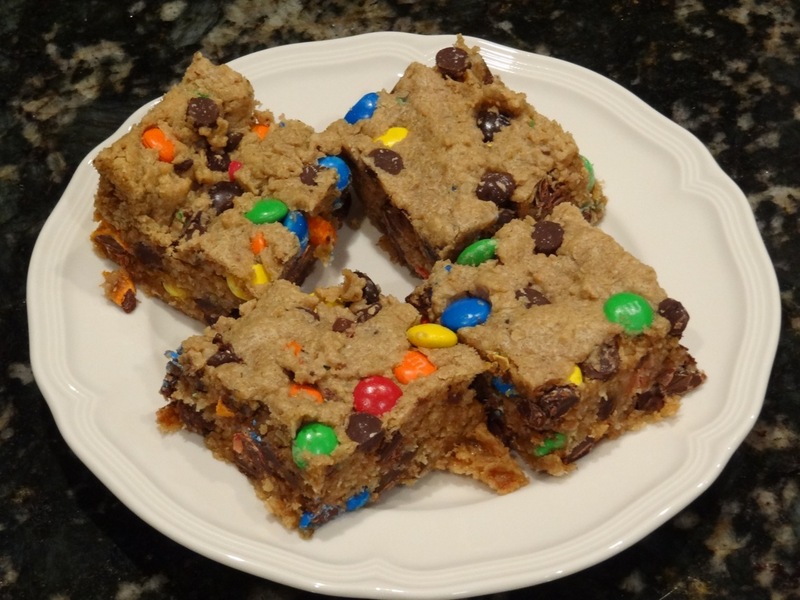 5 Responses to "Monster Cookie Bars"
These look so yummy! I love Monster cookies so I’m definitely going to be trying them so I “Pinned” them for later. Found your post from the Kurtz Corner Linky Party. Thanks for sharing! 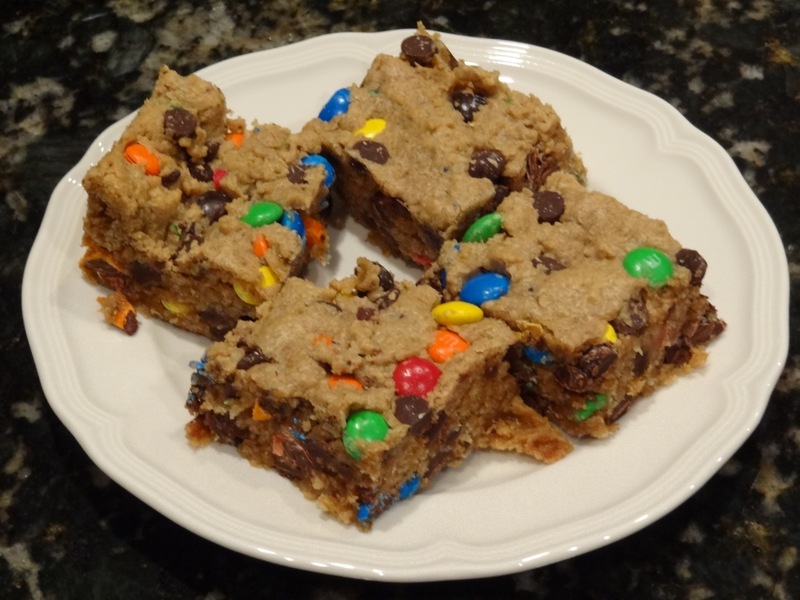 Hi, Ive been on a monster cookie tear for some in bar form. I made one recipe and it was terrible. Its hard to find a good one. Yours are thick & look so yummy..and I sure hope they taste good cause Id like to make them. Is 15-20 enough bake time?…i keep thinking they might turn out raw in the middle. Thank you! All ovens are different, but to check, you can insert a toothpick in the middle to check to see if they are done. If they are not done, the toothpick will pick up too much of the dough. You’ll know when the bars are done when inserting a toothpick and it comes out clean or with just a few crumbs on it. Hope you enjoy! That’s awesome! What a pretty treat using Easter M&Ms!